Willis Eschenbach and Roy Spencer appear to be having a bit of a battle over whether or not the type of citizen science that Willis undertakes has any real merit. Roy doesn’t seem to think that what Willis does has much merit and, I have to say, that I’m kind of with Roy here. Roy Spencer appears to be partly accusing Willis of plagiarism, or – at least – of not acknowledging that some of what he’s suggesting has been done before. In, particular, he’s having a go at Willis over Willis’s Thermostatic Hypothesis. Now, I’ve – in the past – mocked Willis about this and suggested that he was essentially appealing to magic. I had not appreciated that there really was such a hypothesis. Apparently it was first suggested by Ramanathan & Collins in 1991 and Roy seems upset (possibly justifiably so) that Willis does not acknowledge this. Now, I’ve only just encountered this so, maybe, my understanding is wrong. Given that, as far as I understand it, the basic idea is that evaporation of water requires energy, the resulting water vapour can then be transported via convection into the troposphere, where it condenses and releases this energy. Now, when I first read about this I thought “surely this can’t have any effect”, but I think it can (but not a significant one, I think). Let me see if I can explain why. you get that Teq = 288 K, which is about right. So, anyway, the basic picture is that greenhouse gases trap outgoing long-wavelength radiation, causing the surface temperature to be higher than it would be in the absence of an atmosphere. As we continue to add more greenhouse gases (CO2) this will then cause the surface temperature to rise even further. There are additional forcings and feedbacks that tend to result in the equilibrium surface temperature actually being higher than it would be due to rises in CO2 alone. I believe that the whole point of the thermostatic hypothesis is that the greenhouse gases can only operate on outgoing radiation. So, if there is another way in which to transport energy, then that will reduce the equilibrium surface temperature because energy transported by the other mechanism is not influenced by the atmospheric greenhouse gases. Basically, water evaporates at the surface (which requires energy) and is then transported into the troposphere – via convection – where the energy is released when the water vapour condenses. This means that this energy has been transported without being influenced by the greenhouse gases. So, in a sense, I find this quite interesting simply because I didn’t know that it actually existed as a hypothesis. There are, however, I suspect a number of issues with this as an actual regulation mechanism. One is simply that it depends on temperature and becomes more effective as surface temperatures rise. Therefore it could act to reduce some of the greenhouse warming but can’t remove it all or else it would stop operating (or would be operating at the same level as it was before the greenhouse gas concentrations increased). The other is that, I believe, it mainly operates over the tropics where the temperatures are high enough for it to play a role, so it can’t operate effectively everywhere. The biggest issue, however, with this as a regulation mechanism is explained in a comment on an earlier post by Tom Curtis and is illustrated in the figure below. 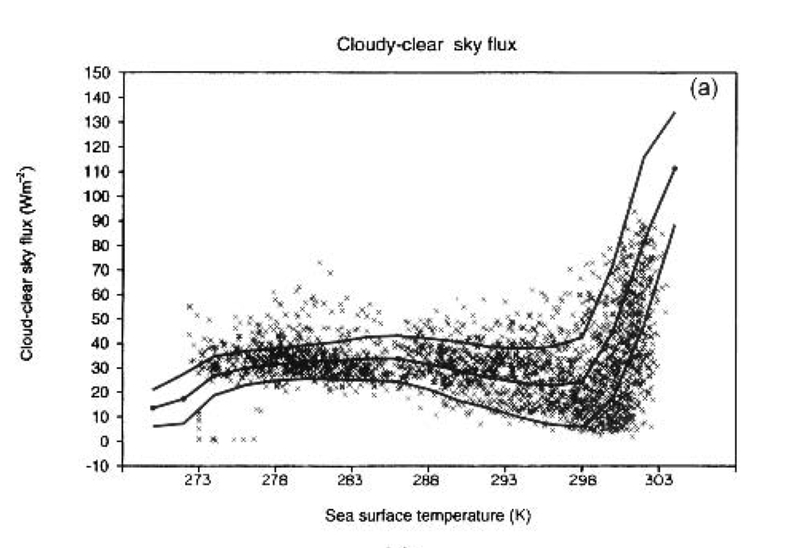 As also explained in Stephens (2005) : [h]ere [the clear sky flux] is broadly a measure of the greenhouse effect of clouds; the highest, coldest clouds that occur with tropical deep convective systems over the warmest sea surface temperatures (SSTs) induce the largest greenhouse effect. So, as far as I can tell, even though convection can directly transport energy to the troposphere, it also acts to increase the greenhouse forcings by increasing the amount of water vapour and clouds in the regions where it operates most effectively. Essentially, I’m kind of impressed that Willis’s hypothesis (which isn’t really his to be clear) actually exists, but it does seem that it doesn’t really operate how he thinks it does and, if anything, ultimately acts to enhance greenhouse forcings, rather than acting to regulate surface temperatures. As usual, if I’ve made a mistake or misunderstood something (which is quite possible given how quickly I wrote this) feel free to point it out in the comments. This entry was posted in Climate change, Global warming, Wilis Eschenbach and tagged Greenhouse effect, Greenhouse gas, Greenhouse gases, Roy Spencer, Stefan–Boltzmann constant, Temperature, Thermostatic hypothesis, Willis Eschenbach. Bookmark the permalink. Interesting that this relates to something in discussion here the other day: more energy in the atmosphere (well, ocean-air system, really) possibly leading to more rapid transport of stuff hither and thither on the globe. More weather in less time. And once more, we have to… wonder at paleoclimate behaviour. Something I was going to put in the post, but forgot, was about the tropospheric hot spot. It seems that some argue that AGW must be wrong because we haven’t observed a tropospheric hot spot. However, as I understand it, the hot spot is meant to be a consequence of condensation of water vapour and so you would also expect one from thermostatic regulation. It seem ironic that someone who might argue that the lack of a hot spot invalidates AGW would then propose a mechanism that would also produce a hot spot and, hence, by the same argument should also be regarded as invalidated. Thanks, that is very good. Clearly much more complicated than I indicate here (not that surprising) and Chris also explains the issues much better than I have. Indeed, and Chris Colose’s post linked to above seems to address some of this. Perhaps WUWT could pay LOWER TAXES!!!! and protect itself against further criticism by registering as a new religion.